Byam Shaw carried the torch of Pre-Raphaelitism across the turn of the century, a period when books and exhibitions had renewed interest in the Brotherhood's work. In his paintings he revived the Brotherhood's use of bright, pure glazes and restated their belief of the importance of truth and sincerity in art. Moreover, he turned to literature and history for inspiration. 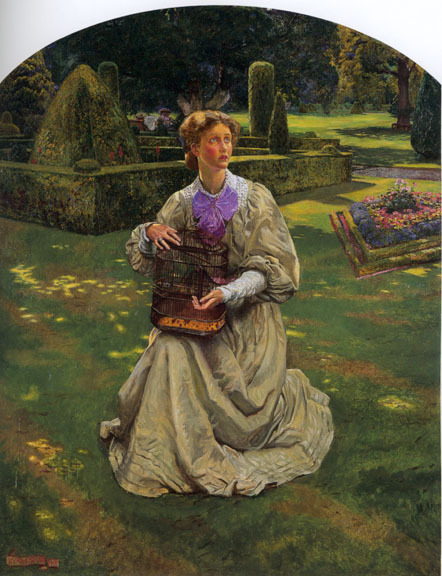 Literary allusions and elaborate symbolism were used to great effect by William Holman Hunt in his The Awakening Conscience to reveal some of the more pressing social problems of the age. A Century of of Master Drawings, Watercolours, & Works in Egg Tempera. London: Peter Nahum, nd. Cole, Rex Vicat . The Art and Life of Byam Shaw. London, 1932. p. 213. The Paintings, Water-colours, and Drawings from the Handley-Read Collection. Exhibition catalogue. London: Fine Art Society, 1974. No. 70.